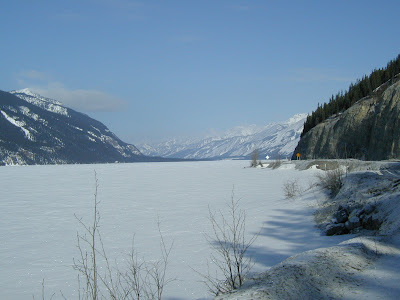 The leg from Watson Lake to Haines Junction was on a clear, cold day. A good reason to avoid driving after dark. 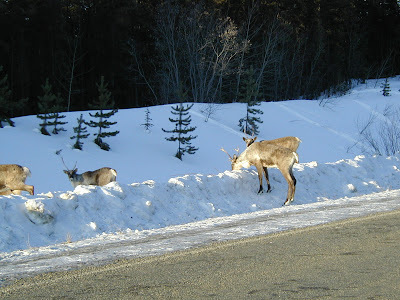 These caribou are licking the salty treatment from the road. I stopped and they continued to ignore me. I started to move slowly and eventually they moved off but I got a couple of "evil eyes" from them. This is more like it. Clear skies, dry road and mountain views. A quick picture through the windshield. There is very little traffic this time of year. 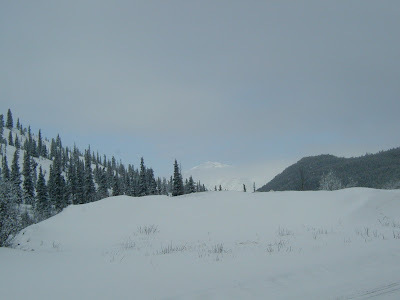 Mountains are almost always in view. 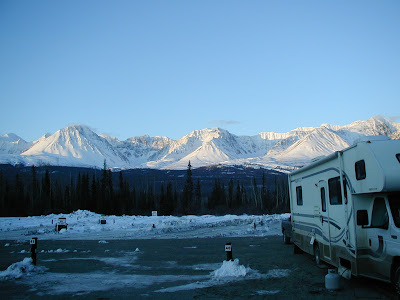 This RV park in Haines Junction was partially plowed and had a live electrical outlet. There was a sign directing you to pick a site and pay in the morning. The office was still closed in the morning so I put the payment in an envelope and dropped it in the mail slot. 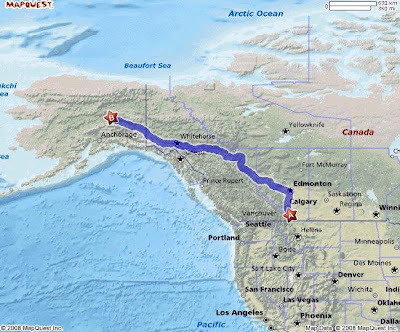 Only a few hundred miles to the border with Alaska! Once I started down I was committed since I knew I couldn't get back up. But I did start to see breaks in the clouds. The distant mountains don't show well here but the views were spectacular. During a flat stretch in the descent I snapped a quick picture of some terrain in the distance. 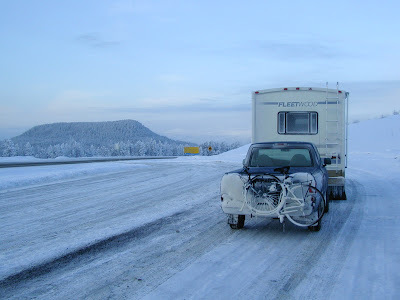 The weather and road kept improving. By Muncho Lake the skies were clear. 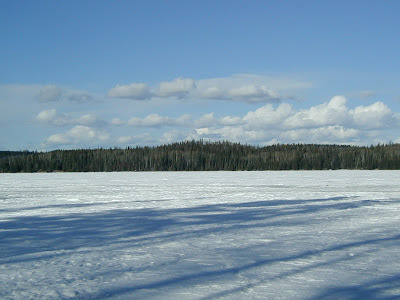 There were many lakes and rivers but with few exceptions they were covered by ice and snow. 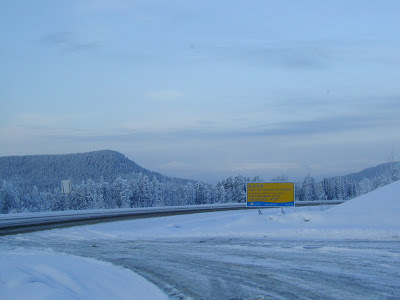 This is looking north with the now narrow highway to the right. At the same spot looking south. 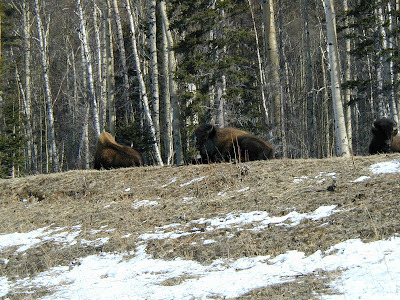 A buffalo near Liard Hot Springs. 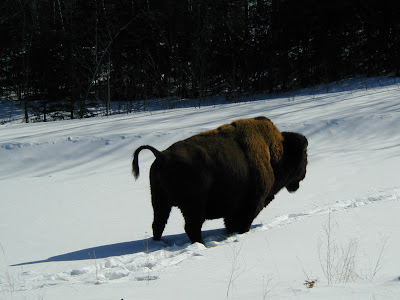 More buffalo from one of the many herds. The ground is actually showing in the sunny areas. The rest of the drive to Watson Lake was pleasant and uneventful. All the RV parks were closed but I managed to track down the owner of one that had an area clear within reach of an electrical outlet. Although he was not really interested, cash talked and I parked behind his convenience store for the night. I appreciated his flexibility. The night was clear and very cold but pleasant. 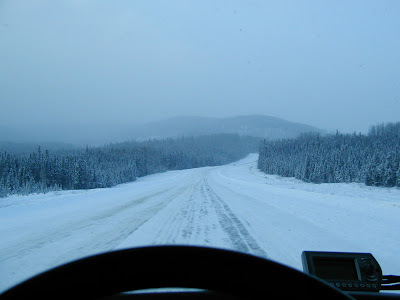 I woke early and was on the road by 0600 although it was still snowing. I didn't know it but leaving early would cost me time. 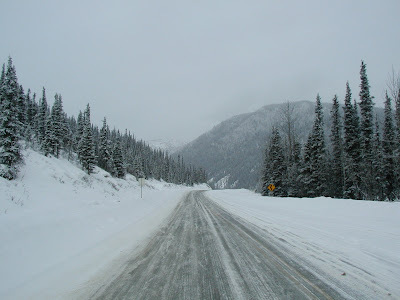 There were few other vehicles on the road and despite the steady snow I didn't see any plows. I made slow but steady progress. Flat road like this wasn't a problem but I knew that there was at least one steep climb before Summit Pass. If the road wasn't plowed and sanded I wouldn't make it up without chains. 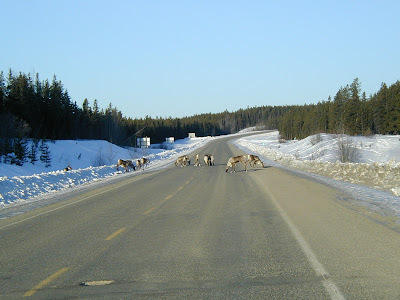 Shortly after this I decided to turn around and return to Fort Nelson. This involved unhitching the pickup, turning both vehicles on the highway and re-hitching. 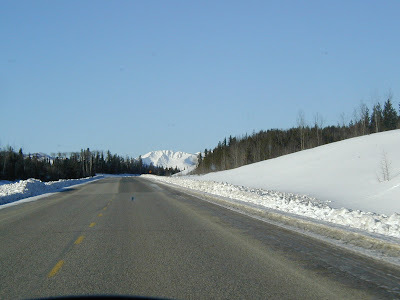 Yes, alone I temporarily blocked the Alaska Highway. Returning, I finally got the lessened snowfall and the plowing I had been hoping to see for the last two hours. I found a place to turn around and decided to try again. The climb had been plowed and was well sanded. There are no pictures because it required full attention and stopping was out of the question. This picture is at the top in a brake check area. I'm now begining to relax but a bit prematurely as it turned out. As you can see the road is in good condition. I was impressed with the plowing and sanding. If I had left a couple of hours later I wouldn't have turned around. Thinking the worst is over, I check that everything is secure before starting the descent. The first of many mountain views. I soon realized that only the approach had been plowed and sanded. For the steep descent, I was on my own. With no other traffic and descending in second gear I was able to keep fair control. I had to squeeze by a tractor trailer that had slid sideways and was "chaining up" in the middle of the road. Today was the longest driving day at, if I recall correctly, about 540 miles. One of the obligatory pictures. The weather is good so I press ahead to make the best of it. 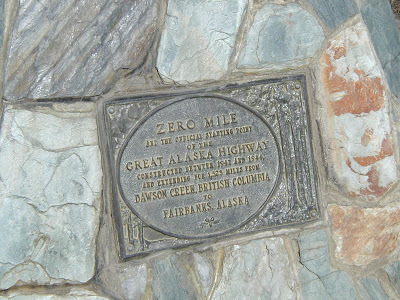 The marker at "Zero Mile". 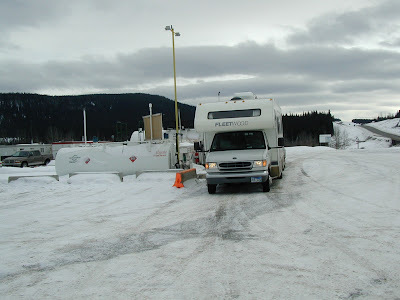 A fueling stop near Buckinghorse River. It's actually a camp for an oil exploration operation but they sell retail... at a price, of course. But they have it and I need it. 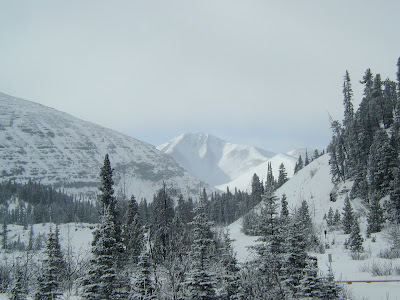 The Provincial Parks, while numerous, were either closed for the season or inaccessible because of deep snow. 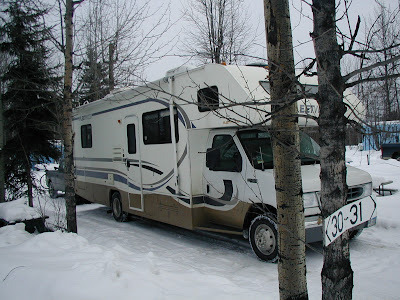 All the commercial RV parks in Fort Nelson, save this one, were also closed. I never saw the proprietor but there was a sign directing you to deposit the fee in a box outside the office. It was now snowing but a plow had been run through the spot and the electricity was on. I was in for the night. 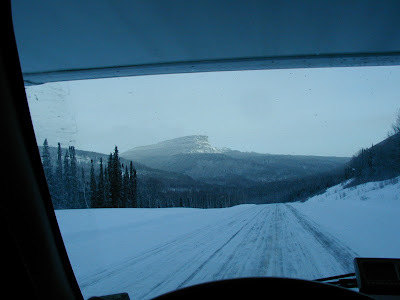 This post is out of sequence but the Internet connection here is slow and uncertain so if anyone is following my progress, I am only 200 miles from Fairbanks, Alaska. 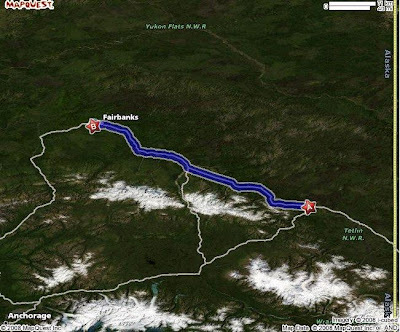 Tok, pronounced "Toke", is hopefully the last overnight stop. I will eventually reconstruct the missing days and post any pictures that may be of interest. 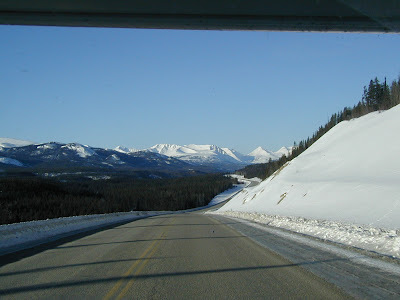 Suffice it to say, most of what you may have heard about the Alaska Highway is true. It is long, rough and desolate but the scenery is beyond compare. It is somewhat more challenging at this time of year with winter-like weather and seasonal closure of most of the facilities. 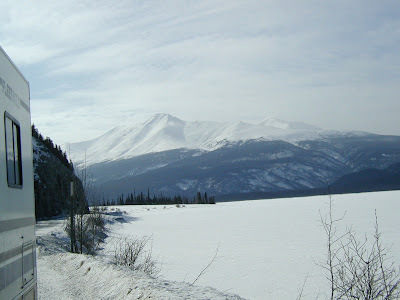 But seeing the mountains in "full dress white" made it worthwhile. This picture is accurate but was taken in summer as only the mountains are snow covered. Taken today, it would be all snow covered. I am looking forward to "break up", when the ice breaks over the lakes and rivers. That's why I'm glad to arrive early. Standing on the frozen lake. This will be a short update until I find out what the surcharges are for Canadian cellular service. Great weather and good road today. 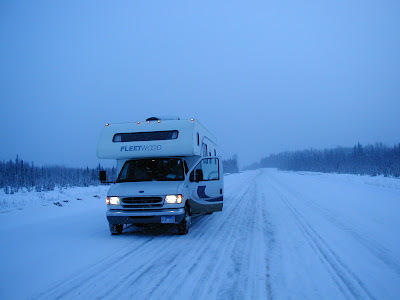 I got stuck in the snow trying to enter a campsite. I was going to keep driving but by the time I finished digging out it was too late to go on. 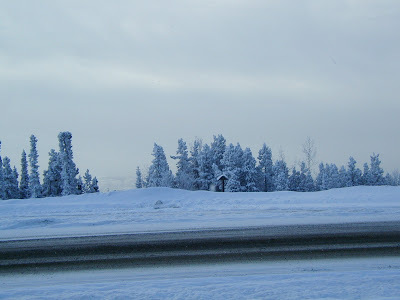 I changed sites but because of the snow I am encroaching on the road. If the ranger makes his rounds tonight he may tell me to move on. 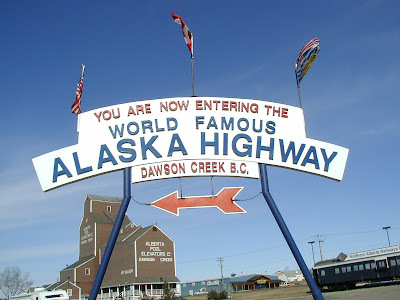 I plan to leave early again and should start on the Alaska Highway at Dawson Creek tomorrow. I'm not keeping my 300 mile per day goal. A late start after looking for parts, a brutal wind that kept the speed down and a wait in line at the border all contributed to another below average day. But the wind was so strong that without dry pavement I would have had to stop, so I guess I'm lucky. Most RV campgrounds are closed for the season but around "quittin' time" I took a chance on a municipal park in Claresholm, Alberta, and was pleasantly surprised. It's neat and clean, the rate is reasonable, electricity is provided and most of all, it was open. 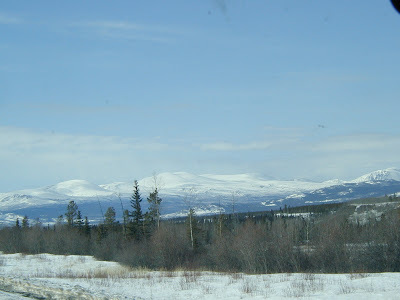 Towns are few and far between, and this is the populated area of Canada. As a challenge I tried setting up the satellite. It is obviously at the limit of its "footprint" but after some tweaking I got a connection. This may be the last one until I try to switch "birds" in Fairbanks. Claresholm is an interesting town that I would stay and explore if I weren't in a rush. Perhaps on the way back. I want to pick up the pace tomorrow but since I have an Internet connection I will be tempted to read the news, check email and drink coffee before I leave. Perhaps I will put the coffee in a thermos and try for a 350 mile day if the weather is good.